American zoologist who spent years studying and protecting the mountain forest gorillas of Rwanda, central Africa, about which she wrote in Gorillas in the Mist (1983). 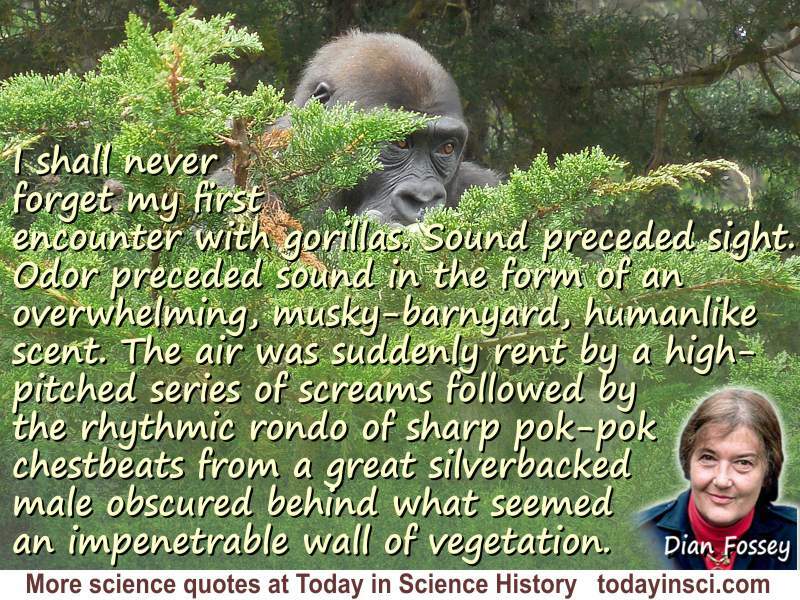 The quote comes from early in the first chapter of Dian Fossey's well-known biographical book, Gorillas in the Mist. She had flown in September 1963 to Africa to see the mountain gorillas of Mt. Mikeno in the Congo. She first met with anthropologists Louis and Mary Leakey excavating at Olduvai. From there she went to Kabara in the Virungas mountains, and was led into the forest by photographers Joan and Alan Root, then filming a documentary on the mountain gorillas. They froze until the sounds faded and crept forward through the vegetation and saw “an equally curious phalanx of black, leather-countenanced, furry-headed primates peering back” at them. Science Quotes by Dian Fossey. 16 Jan - short biography, births, deaths and events on date of Fossey's birth. Gorillas in the Mist, by Dian Fossey. - book suggestion.